Here I am playing the “woman card” again. All three of this week’s reviewed books are by and/or feature female lead characters. This is the face of comics in 2016. As a reader, I’m enjoying this turn of events. As a writer, I relish the challenge of competing in this suddenly wider field. 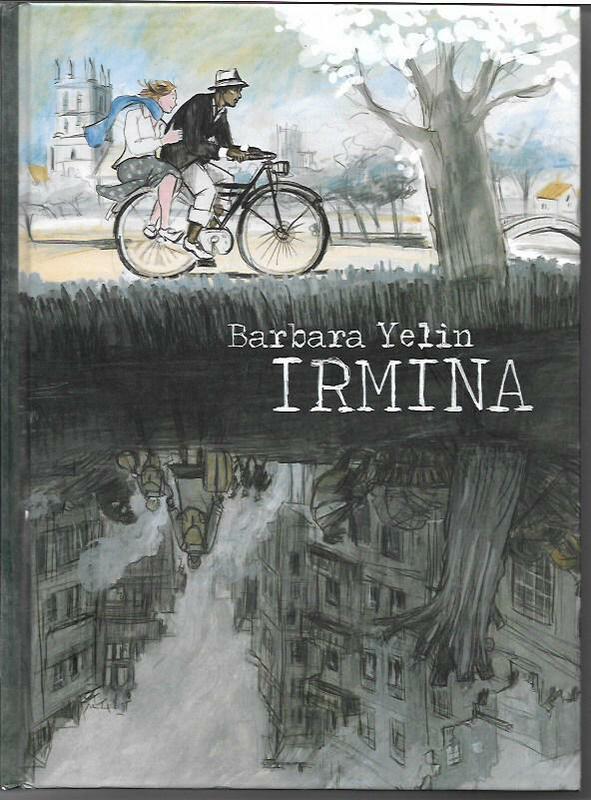 My pick of the week is the utterly haunting Irmina by Barbara Yelin [SelfMadeHero; $24.95]. Taking place from 1936 to 1983, the graphic novel was inspired by diaries and letters found among Yelin’s late grandmother’s things. The resultant book is every bit as gripping and remarkable as it is haunting. Irmina is an ambitious young German woman who comes to London when she is denied the educational opportunities afforded her brothers back home. She attends a commercial school for woman and hopes to make her own way in the world. The freedom and lights of England appeal to her. Invited to a party, she meets Howard, one of the first black students at Oxford, and the two become close friends. Perhaps more, though Yelin is circumspect in that regard. What is clearer is the bond between these young people and it seems enough like love for me to look at it that way. As the winds of war build in Europe, Irmina is forced to leave her London lodgings to return to Germany. She tries to remain distant from the Nazi regime, ever longing to return to England, but that becomes impossible. She deals with depravation and resents having to make sacrifices for situations she believes have nothing to do with her. But, as one door after another closes, she ends up wed to an SS officer. It becomes hard to remember the woman who loved and tried to stay in touch with a man of different race. The resultant examination of her life in wartime Germany is unsettling, even as if avoids graphic depictions of violence. The horror and the terror of Nazi Germany may be background notes, but they have a profound effect on Irmina. Set in 1983, so distant from World War II, the final chapter of the graphic novel comes as an amazing surprise, leading to a relatively quiet yet satisfying ending. The story lingers with the reader. In my case, it hasn’t been far from my thoughts since I finished it. At a time in my country’s history when a presidential candidate is openly campaigning on a platform of bigotry and racism – and doing quite well with that platform – Irmina haunts me. This hardcover graphic novel weighs in at around 300 pages. Yelin’s full-color art is as evocative as the story she tells. A concluding essay by Dr. Alexander Korb offers further information and insights on life in Nazi Germany. Irmina is a must-read and must-have book for libraries, public and school and personal. It will surely be a contender for next year’s Eisner and other comics awards, and for awards outside our comics industry. It deserves such consideration. 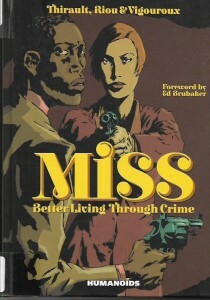 There are several complete-unto-themselves stories collected in the 196-page, full-color graphic album. Each is a satisfying tale with background threads that carry over from story to story. There is a hardness to each tale that reveals the dangers of the era and the world within which Nola and Slim must walk. There are many moments of dark humor and shocking violence. It’s not a book for the faint of heart, but it’s wonderful all the same. I liked it a lot and I think you will, too. Let’s lighten things up for the finale of this week’s adventures in comics. 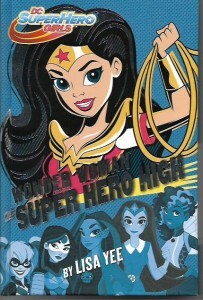 Wonder Woman at Super Hero High by Lisa Yee [Random House; $13.99] is a prose novel for middle school readers that takes place just before the DC Super Hero Girls special which I wrote about a few weeks back. Yee’s a prolific writer with over two million books in print and “the second-largest collection of Winnie-the-Pooh memorabilia in the U.S.” She is worth checking out online because she’s almost as fascinating at the super hero girls she’s writing about in this book. This is Wonder Woman’s introduction to and first year at Super Hero High. She’s innocent and naive, which does get a wee bit grating at times. But, every time my eyes starting rolling from what it really the only even minor flaw in this novel, Wonder Woman or one of the other characters would do something amazing or delightful. This is a world in which future heroes and villains are classmates or other school rivals. The different takes on the characters are intriguing. This is the kind of book that makes one realizes just how malleable classic characters can be and why, as long as writers retain a character’s core values, continuity has long since ceased to be an issue for me. Characters created several decades ago need not be set in unyielding stone. They need to be kept fresh for all the generations of fans yet to come. The novel is a breezy read. The design of the book is terrific and welcoming. I enjoyed it quite a bit and think it’d make a wonderful gift for young and old fans of these characters. The young readers will relate to Wonder Woman, her friends, her foes, her teachers. Older readers, especially the parents among us, will find the new young takes on the characters entertaining and realistic. It’s not what they’re used to, but that only adds to the fun.